Historic bandstands feature some of the most scenic and peaceful pavilions for rest and romance, especially if placed with a water view. 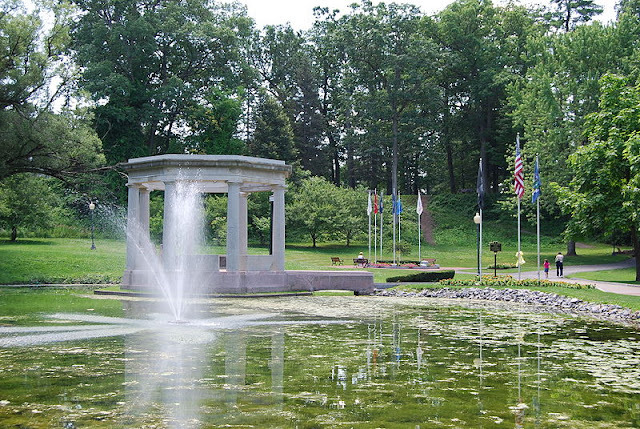 A perfect example is the bandstand found on the banks of the Great Basin, central to the grounds of the 1904 Louisiana Purchase Exposition, informally known as the St. Louis World's Fair. 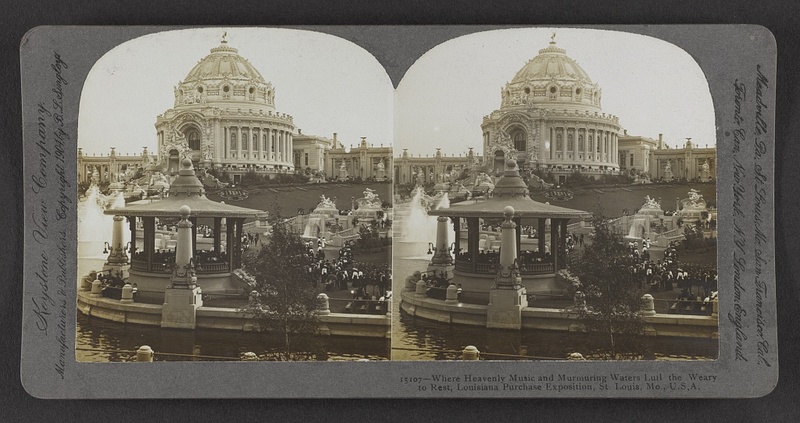 Indeed, the stereograph's title even reads, Where heavenly music and murmuring waters lull the weary to rest, Louisiana Purchase Exposition, Mo, U.S.A.
Where heavenly music and murmuring waters lull the weary to rest, Louisiana Purchase Exposition, St. Louis, Mo., U. S. A., 1904. 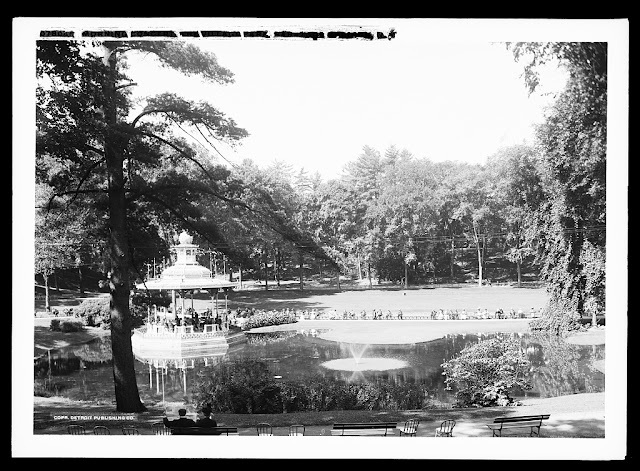 Source: Library of Congress Prints and Photographs Division Washington, D.C.
Saratoga Springs, New York, built a Victorian bandstand in 1882 as part of a pond in Congress Park. It was used for concerts and relaxation until 1929. It was replaced in 1931 with a war memorial using a similar, yet updated style which is still standing where the old Victorian bandstand stood. Morning concert, the village park [i.e. 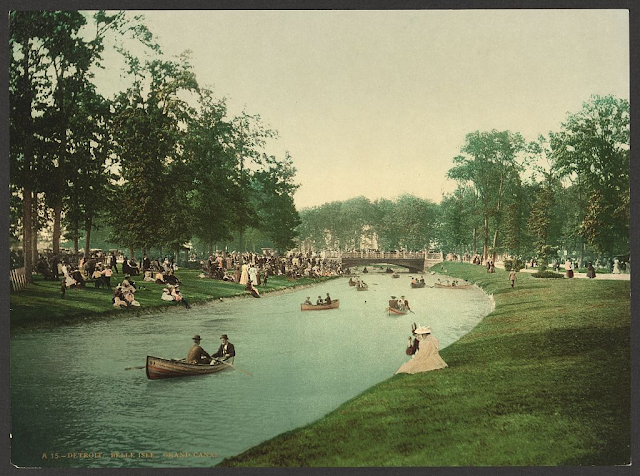 Congress Spring Park], Saratoga Springs, N.Y., c1900-1915. Source: Library of Congress Prints and Photographs Division Washington, D.C. Situated between the USA and Canada, Belle Isle of Detroit, Michigan, is where we find a fascinating bandstand on a bridge over the Grand Canal. I located this bandstand via the Library of Congress (LOC) Prints and Photographs Division and thought it a lovely setting for a musical concert, especially if you were one of the ones floating in a boat. 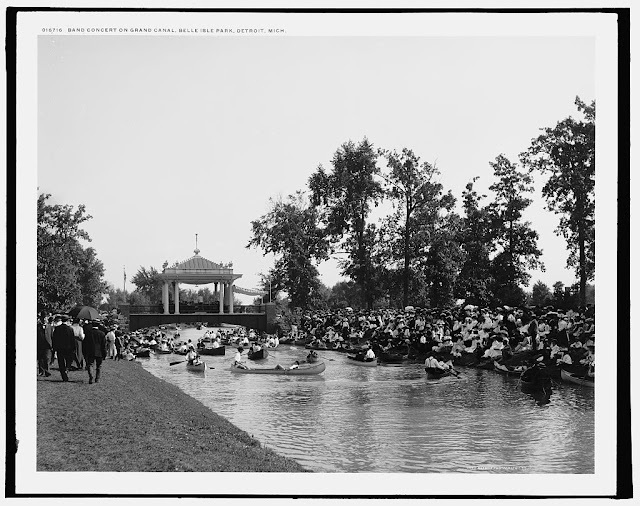 Band concert on Grand Canal, Belle Isle Park, Detroit, Mich., between 1900 and 1906. Source: Library of Congress Prints and Photographs Division Washington, D.C. I was quite surprised then to find the earlier postcard (below) and later images, that don't show the bandstand. The LOC image cites the image taken between 1900 and 1906, yet the postcard is dated between 1898 and 1905. In that case, I deduced the bandstand was for a 1906 event, yet can find no record for its existence. Regardless, it's a beautiful setting for a bandstand. Detroit. Belle Isle, Grand Canal, between 1898 and 1905. Source: Library of Congress Prints and Photographs Division Washington, D.C. 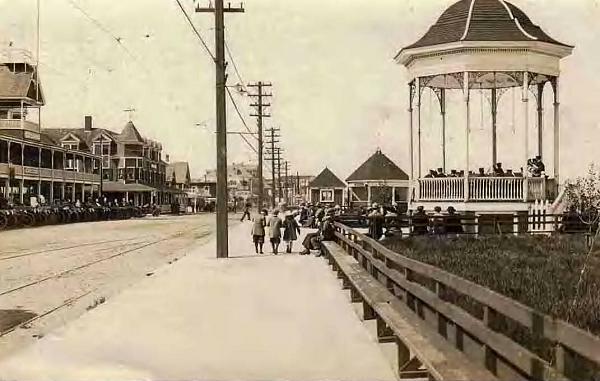 The Hampton Beach bandstand was built in 1900 as part of the boardwalk along the Atlantic shore. As a bonus to the tourist industry, daily concerts were held with the music carrying over a large distance due to the acoustic properties of the high ceiling. When not in use, people who didn't live with a view could watch the ocean activity from the shelter of the bandstand. Can you see the musicians? 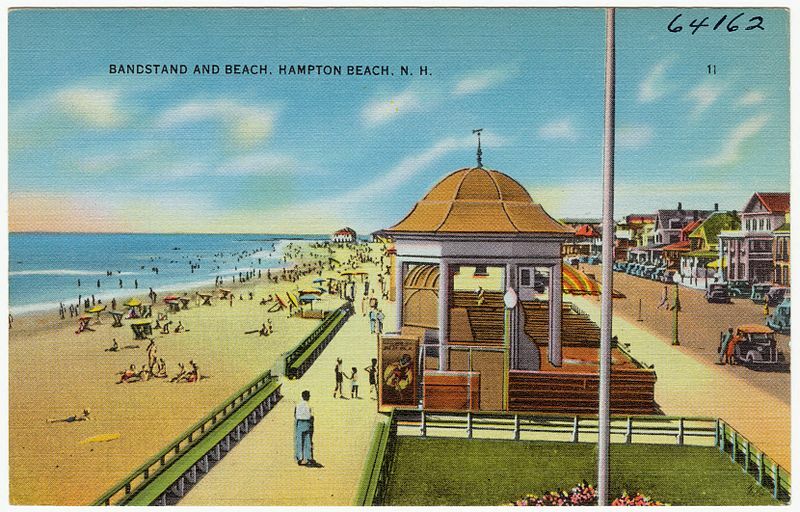 The Hampton Beach Bandstand entertained the public until 1963 when it was razed to make way for a bigger beach-side facility including an updated bandstand. 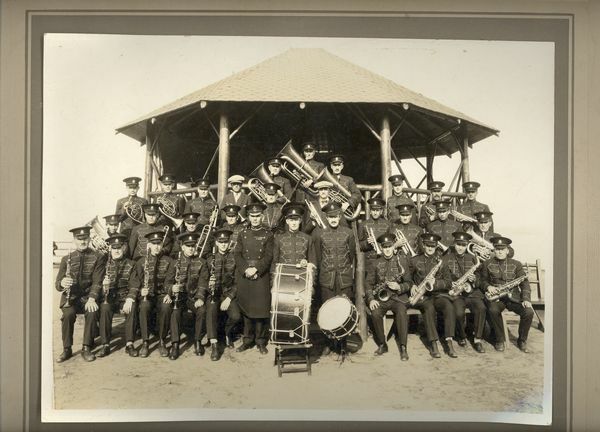 If you're interested, find more historic info and fascinating images at the website, The Hampton Beach Bandstand. Also near the Atlantic Ocean sits the Bandstand on Lee's Promenade in Folkestone, England. Tended and painted over the years, it has a tremendous vantage point above the chalky cliffs of the English Channel. I hadn't realized that when I looked at this 1905 postcard which shows an image created between 1890 and 1900. Yet my research revealed zigzag walking paths leading down to the Folkestone Harbour. Now that's a bandstand with a view! 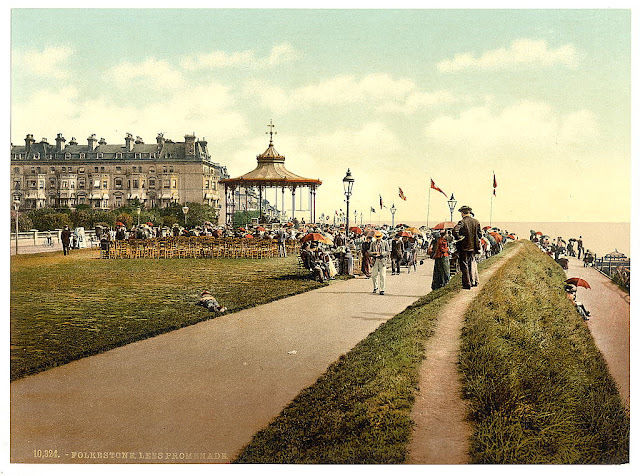 Lee's Promenade and Bandstand, Folkestone, England, between ca 1890 and 1900. Source: Library of Congress Prints and Photographs Division Washington, D.C.
At Chippewa Park in Fort William's early days, before amalgamation with Port Arthur created the city of Thunder Bay, Ontario, the bandstand wasn't just on the Lake Superior shore, it was actually off the shore and on the water. Built in 1924, the wooden bandstand was connected to the shore via an elevated boardwalk. Although the bandstand was in regular use for Sunday afternoon concerts by the Fort William City Band in the early years, its location lent it to heavy weathering from summer storms and winter blizzards that slowly took its toll on the wooden structure. 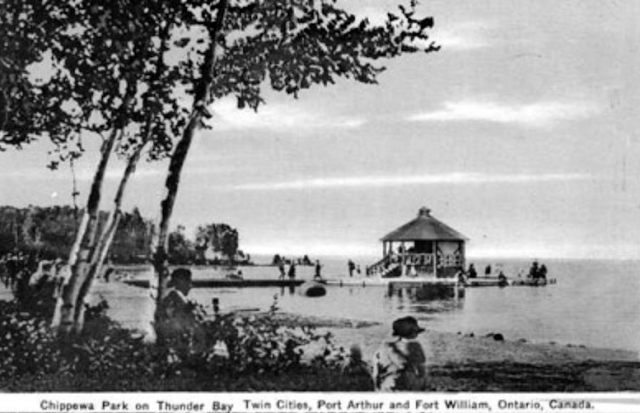 In 1954, the bandstand was bulldozed and has never been replaced. I remember going to Chippewa Park as a child, but I don't remember the bandstand, possibly because my parents weren't beach-type people. Instead, we went on some of the amusement rides including the carousel, and walked through the zoo's live exhibits of small Northern Ontario animals. I camped at Chippewa Park a few years ago and the raised sidewalk pylons and base are all that's left of the bandstand, reminders of what was there with the possibility of something in the future. Meanwhile, the summer concerts continue on an outside stage attached to a nearby pavilion where people don't need to get sand in their shoes to enjoy the music. Your turn... What's your favorite scenic or romantic bandstand setting, whether factual or fiction in any media? At this moment I can't think of any "moment" I've read about or seen that involves a bandstand. But the potential is rich!!! Thanks for the post! You're welcome, Connie, and I appreciate your response. 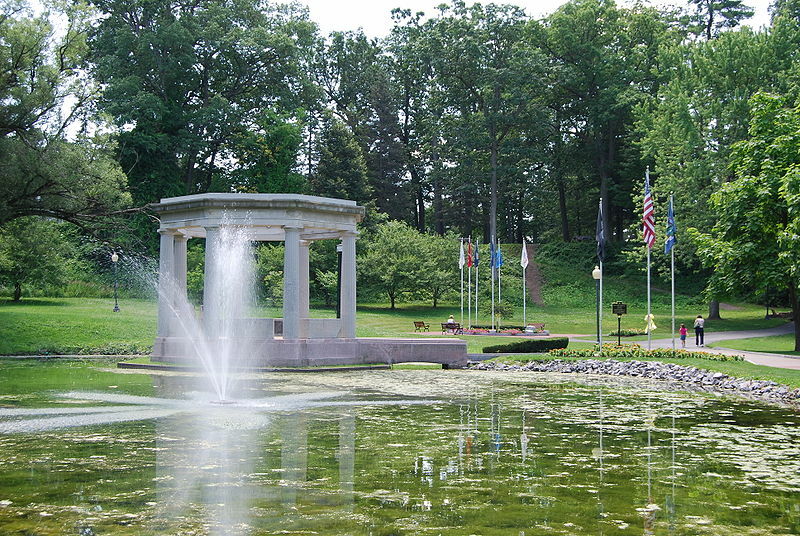 I was going to say my favorite scene is the "Sixteen Going On Seventeen" scene from the Sound of Music, but when I pulled it up on YouTube, it showed that they used a glassed-in gazebo. And all these years I remember it being a bandstand and the two of them looking out into the rain. The music wouldn't carry very far through the glass though. Boo hoo. Interesting post and the pictures added so much for scenic bandstands. I cannot think of one specific bandstand at this time. I look forward to the next blog. Very interesting post Anita. Loved the pictures.